I had to have a garden gnome. My wife asked why I had the sudden urge to decorate the garden, and why a gnome. “Don’t you think a garden gnome is like having those big pink plastic flamingos in the yard?” my wife asked. I set up our new garden gnome near the front gate of our home so that the terracotta elf could sort of greet people who walked down the path toward the front door. I named the gnome Lampy, a good gnome name. And there he stood wearing a red pointy hat, pipe in his mouth, welcoming every single one of our guests to our home. My wife seemed pleased. My wife didn’t respond. I think she was admiring the gnome splendor in our yard. My 5-year-old son, however, seemed frightened by ol' Lampy. “Does he really come to life at night?” the boy asked. “That’s what Daddy said,” my wife answered. Then she told me that maybe we shouldn’t have anything roaming around in the yard at night. It would, in fact, scare our boy. I worried. I didn’t want to scare my son. My son ate up the Santa’s elf bit, and he was no longer scared. I think my wife was happy that we were able to keep the gnome. 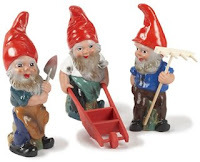 So I ran down to the store and bought a few more gnomes. As I set up Bimpni and Lumwinkle in the garden, I told my wife and son that having gnomes was like having pets. We now have a lot of responsibilities, I said, because gnomes require lots of attention and care. My wife fell silent again. She reminded me of a game called “gnoming,” where juveniles kidnap a homeowner’s gnomes and send them on trips around the world, positioning them in front of various landmarks for photographs that later show up in the homeowner’s mailbox. I was stumped. I didn’t want anyone stealing our gnomes, and I didn’t know how to combat that kind of criminal behavior. I told my wife not to worry, that I’d sleep on it. The next morning, last Sunday morning, I woke and went outside to check on our little gnome village. The gnomes were gone! I was outraged. My son said he wondered if they came to life and ran away. My wife took it the hardest. She put on quite the show. “Oh, that’s so terrible,” she said. “And I loved them so much.” She was clearly upset. So I bought another family of gnomes to cheer her up. My wife was so surprised. I told her that that’s what husbands are for. And then she came clean and said she never liked the gnomes. I was sad to hear the cold truth. To make her happy, I returned the gnomes to the store. Yes, my wife was happy. But I still wonder: What was so bad about my garden that made our first batch of gnomes run away?